Parramatta Eels Rugby League star Anthony Watmough has shared his relief and joy at the news his unborn baby daughter has been cleared of a fatal chromosomal abnormality. The daughter of Watmough, 32, and his wife Elle, 25, was thought to have Trisomy 18 but has been cleared after five harrowing weeks of testing. With an ultrasound picture and caption posted to the football star’s Instagram account, the couple says their baby girl has beaten the odds and is healthy. “We have a rare condition called Confined Placental Mosaicism where the T18 cells are confined to the placenta but are not present in the baby. 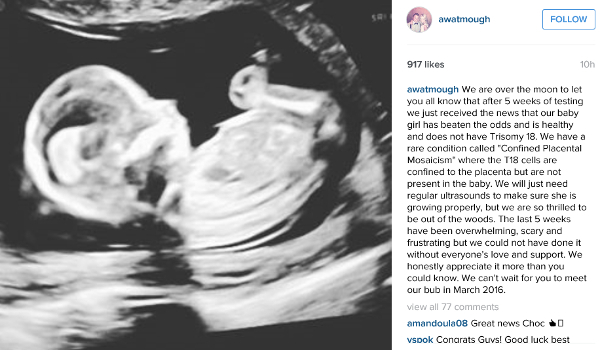 We will just need regular ultrasounds to make sure she is growing properly, but we are so thrilled to be out of the woods,” Watmough says. The rare condition their daughter has been diagnosed with occurs when there is a chromosomal difference between the baby and the placenta. The Watmoughs first shared their heartbreak at the suspected Trisomy 18 diagnosis – which can result in stillbirth or birth defects – four weeks ago. “The best/worst day of our life. For those that follow our journey, Elle and I found out we are expecting a baby girl, however we also found out that she may have Trisomy 18, news that shattered us. 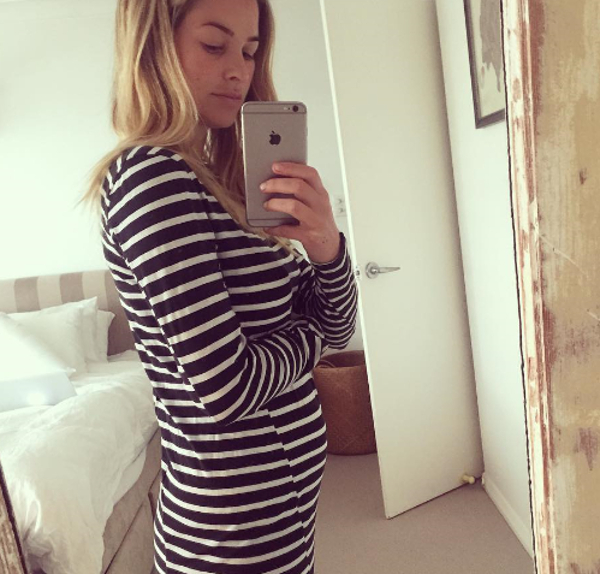 We are hoping for a miracle for our baby girl,” the footballer wrote on Instagram at the time. The couple had undergone IVF to fall pregnant because of Elle’s reduced fertility due to endometriosis. “This is not a story to gain sympathy,’’ she writes on her blog. “We are fine. We are doing what we need to do to make it happen. I have two wonderful step children so we are blessed in that area already. “But I wanted to shed light on this experience and what I have learnt. I want to tell women, if you don’t feel right, if you feel like something is wrong, push for additional tests to be performed. The baby, their first together, is due on March 9, 2016. Elle is also a proud step-mum to Anthony’s two children – Claudia, 14 and Jake, 12 – from a previous relationship.